The Coloplast Catheter Self-Cath family of latex-free catheters offers patients a variety of options for intermittent self-catheterization. Each catheter is made with the highest quality standards dedicated to patient comfort and ease of use. 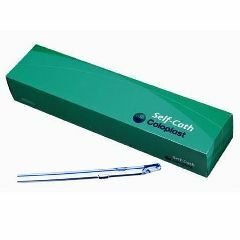 The Coloplast Self-Cath Coude Catheter allows for monitoring of catheter tip position during insertion and removal. Latex free with unique Guide Stripe which assures proper placement of the angeled coude tip. dialogue to continue our heritage of innovation and service. continue to be available from Coloplast. They delivered the product I ordered exactly as promised. Also provided FedEx tracking number so I could keep an eye on it. I have already bought from them again and plan to continue to do so. I needed this for my weak blader problems.